The first inhabitants of Newfoundland and Labrador - the Maritime Archaic Indians - quarried local stone as early as 7500 years ago. Precontact people were selective in their use of stone; for instance, they ground slate to make wood-working tools, knapped chert for sharp or pointed hunting blades, and sculpted soft soapstone for functional utensils and symbolic items. Some distinctive types of raw material, such as the banded chert from Ramah Bay in northern Labrador, were highly prized and sought after. In fact this particular chert has been found in archaeological sites as far south as Maine and probably represents the first established trading network for mineral resources from the province. The first historical mineral discoveries were made in the late 1550s when ships sailing along the coast, charting the unknown and trading in fish, brought back reports and samples of "ore" to England. Incredible numbers of mining ventures were financed over the next 300 years, often based on great dreams but little evidence. Engineers, gentlemen, shysters and rogues all arrived at one time or another to investigate and develop the mineral wealth of the colony. The Notre Dame Bay area is particularly rich in copper showings, and news of finds there in the 1870s prompted activity along other parts of the coastline. 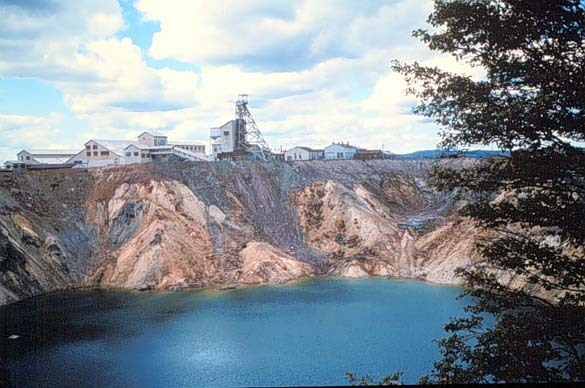 The copper mines of the Baie Verte Peninsula and Notre Dame Bay attracted such notice that in 1897 a proud colonial government issued a 5-cent stamp that showed miners at work underground in the Tilt Cove Mine. This was the first mine-motif stamp issued in the world. The 5-cent stamp issued in 1897 that showed miners at work underground in the Tilt Cove Mine. Reproduced by permission of Trevor Bell. Photo ©1998. It was not until completion of the railway across the island in 1897 that the interior became easily accessible. In 1905 the Anglo-Newfoundland Development Company was granted exclusive timber, water and mineral rights for 99 years to 6000 square kilometres of land surrounding Red Indian and Victoria lakes. While the main purpose of the company was to develop a pulp-and-paper industry, it also took its minerals mandate seriously. By 1906 zinc and lead showings on the north shore of Red Indian Lake were being investigated, and finally in 1927 the rich Buchans deposits were in production. The company town of Buchans saw nearly 60 years of prosperity before the mines closed in 1984. Continued prospecting throughout the interior has turned up numerous small showings to tantalize the adventurous, although another "Buchans" has yet to be discovered. 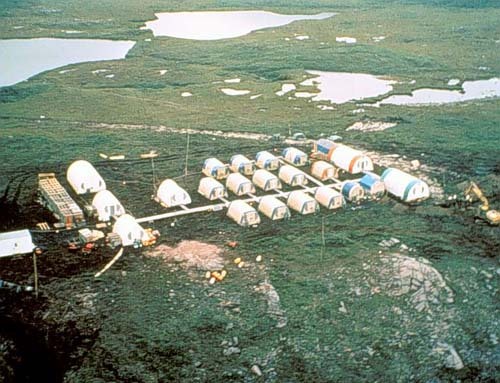 This large exploration camp was located at a mineral prospect that later went into production. Large tents at the far end are the cook/storage and office tents. The area with the fuel drums is the helicopter pad. Reproduced by permission of David Liverman, Government of Newfoundland and Labrador. From Geological Survey of Newfoundland and Labrador - "Aspects of Mining in Newfoundland and Labrador: Production." https://www.gov.nl.ca/mines&en/geosurvey/. Core Box Containing Diamond-Drill Core. The core collected from the exploration sites is labelled and catalogued for further use. 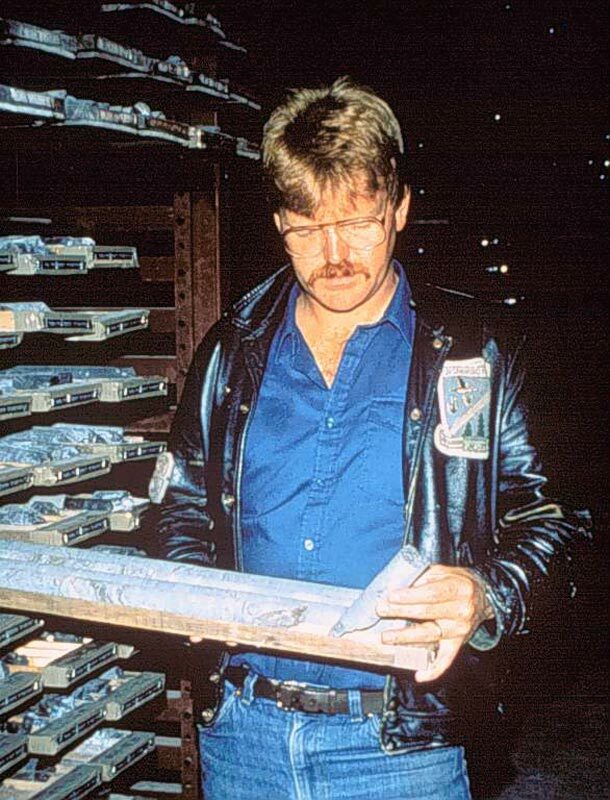 Core samples are permanently stored in government-owned core libraries. Compared with most parts of Canada, Newfoundland and Labrador is still in the early stages of mineral exploration. This is especially true of Labrador, where the huge iron ore deposits in the west were first noted in the 1880s but not developed until the 1950s. Between Labrador City and the east coast lies a wilderness that is vastly unexplored.